I'm happy to announce that Tom Scioli, artist on Image's Godland and The Myth of 8-Opus, has agreed to provide the cover for the third issue of Teddy and the Yeti. 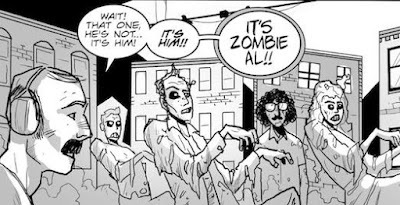 Tom and I both had stories published in 2004's Strip Search from Dark Horse (has it been that long ago?? Ugh, I feel old), and he hails from the bejeweled city of Pittsburgh, so you know that he's the right man for the job. Tom joins Phil Hester (issue one cover), Todd Nauck and our own Duane Redhead (who will both have covers for issue two) on the series. You can check out more of his work at http://tomscioli.blogspot.com and http://www.geocities.com/sciolit/home.html. I'll post some preview art as soon as it's available. Issue three features three separate T&Y stories on the inside...so I thought it'd be appropriate for the cover to tell a story, too. That's all I'm saying for now. 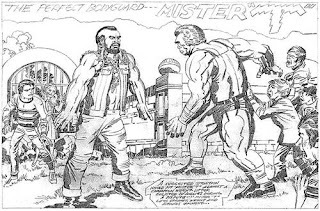 I was looking for examples of Jack Kirby artwork on Google, and this image to the left showed up relatively early. I have no idea as to its authenticity - Kirby's style is not only awesome, it's also popular, so there are a number of artists who draw in homage to him - but even so, I love it. I do agree with the caption that Mister T would be "the perfect bodyguard", but still, I'm struggling to wrap my head around this. When is this from? 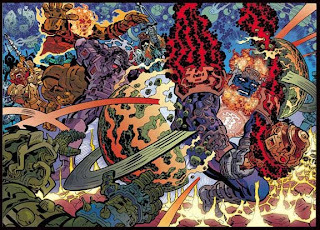 Is it actually Jack Kirby's work? Why would "The King" draw...Mister T? This is all so confusing. I few weeks ago I picked up a copy of King-Size Hulk #1. We all know what books like this entail - a few new short stories of little relative consequence followed by tons and tons of reprinted material. In that regard, at least, this issue did not disappoint. This has nothing to do with my overall point, though. 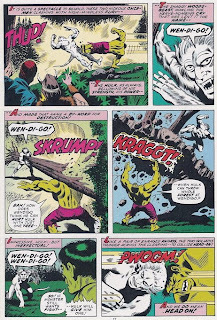 King-Size Hulk #1 reprinted two issues of the Incredible Hulk - numbers 180 and 181, known to many as the first appearance of Wolverine. These issues also heavily feature a rather Yeti-like villain in the Wendigo. The Wendigo actually springs from Algonquin folklore and served to dissuade others from becoming cannibals (I guess the temptation used to be pretty great), but I know this comic book version best - or, that is, I know the X-Men arcade game equivalent of the comics Wendigo. Though the game itself must be between 15 and 20 years old, the arcade X-Men video game has probably swallowed more of my quarters than any other arcade game not named TMNT or Ms. Pac Man. The X-Men arcade game was a sprawling, epic journey that always took me like ten bucks to beat, but was so addictive that I didn't care. To me, at least, the most annoying end-of-the-level bad guy was the Wendigo, who would do nothing other than swipe at you and chant - incessantly - "WEN-DI-GOOOO! WEN-DI-GOOOO! WEN-DI-GOOOO!" to the point of insanity. I have never understood why this is the only word the character, in the books or in the game, would ever be able to say. He never even had distinct intonations as far as I could tell, just his name, over and over again! This must be why, in the first panel of the page linked above, the Hulk is seen kicking the Wendigo directly in the groin. Serves him right. It didn't hit me until I saw it. 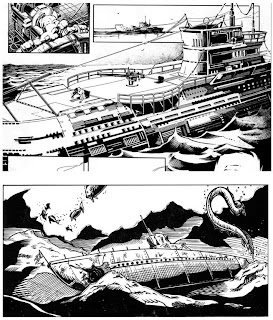 Last month Duane sent over an inked copy of our first issue's page eight, which takes place, as you can see from the picture to the right, on a high-tech submarine out in the open water. I had written the script calling for the sub, but until I saw the finished product I didn't realize that I, apparently, have some weird fascination with the water-faring craft. I can't explain it, but it must be true. A few years ago I wrote a short story titled "The Deep," which was very ably handled art-wise by Jason Seabaugh, Rusty Gilligan and Adnan Virk. The story deals with two poker-playing skeletons trapped on a sunken...wait for it...submarine. Now, two appearances don't in and of themselves make for a mental disorder per se, but the fact that they keep sneaking into my subconscious is interesting nonetheless. If you click on the picture, you'll see a clip from page eight of Teddy and the Yeti #1 on top, while the sub from "The Deep" is on bottom. Great stuff from both art teams. Spending time dwelling on these ships reminds me of a piece of my own history. Like many people my age, I had a grandfather who served in World War II (the other barely missed being drafted, turning 18 in September of 1945 and being stationed in post-war Japan). My father's father spent time aboard a submarine in the European theater, seeing active combat in what I could only guess would be a terrifying sequence of events the likes of which I'll never be able to comprehend. His ship was attacked and hit with a torpedo that crashed through the hull, striking my grandfather and breaking his back. The torpedo, however, was a dud and therefore did not explode (my grandfather, who also went blind from the incident, later regained his ability to walk and see, much to the doctor's amazement). This is an incredible story of its own right, but when I think about how it pertains to me and my very existence...well, it's more than a little worrisome. To think, the only reason I'm alive - the only reason my dad and uncles and aunt and sisters and cousins are alive for that matter - is because some Nazi building torpedoes screwed up and didn't do his job.